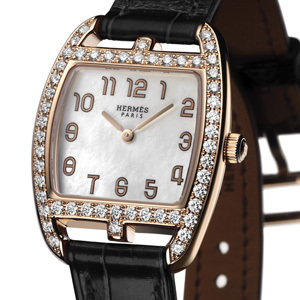 With this new interpretation of the Cape Cod Tonneau watch, Hermès displays its deep-felt attachment to the famous seaside resort on the East Coast of the United States and to the collection named after it. The distinctive design evokes the link of the Hermès anchor chain and takes on an even more precious and authentic dimension with a rose gold case set with 52 full-cut diamonds. 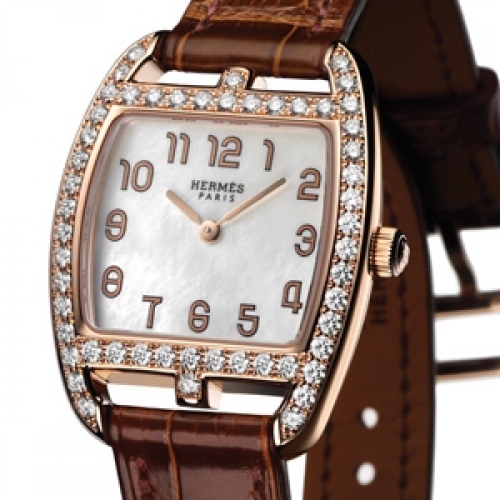 Their subtly luminous reflections echo the white mother-of-pearl dial and the delicate sprinkling of stylised numerals. A stunning celebration of life’s most precious moments.